The world's media were left stunned on Saturday after England's [ ] news briefing for Sunday's World Cup clash with Germany [ ] lasted barely five minutes and featured only questions taken from British TV reporters. 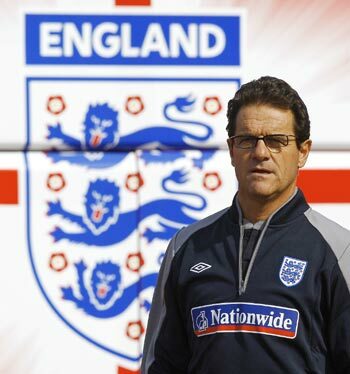 More than 250 journalists from around the world plus around 30 TV crews packed into the media tent at the Free State Stadium for the briefing with England coach Fabio Capello [ ] and captain Steven Gerrard [ ]. Reporters, many of whom had travelled long distances to be at the briefing, left in anger after the FA's Head of Media Adrian Bevington took only eight questions from hand-picked reporters. Giancarlo Galavotti, soccer correspondent of Italy's [ ] Gazzetta dello Sport who has reported on English soccer from London [ ] for more than 25 years, said: "That was typical. They do not seem to appreciate this is the World Cup, with the emphasis on the word 'World'. "The idea that the English set-up is not the friendliest among the top teams is reinforced by this sort of arrogance. "And this, despite the coach being able to answer in three languages: Italian, English and Spanish. The FA do not seem to think the rest of the world is important," he added. Jorge Luiz Rodrigues of Brazil's [ ] O Globo newspaper was stunned by what he saw. "That was bad. This is the World Cup. This guy doesn't know what the World Cup is. He only asks for questions from his friends. This is not professional. "If you go to Brazil you will have questions in English, Spanish, Portuguese, Italian. "All the journalists have the same opportunity. And Brazil is five times champions, not once," he added. Bevington told afterwards: "We complied fully with FIFA's [ ] regulations by bringing the coach and a player, our captain, to the conference. "Furthermore, and as agreed with FIFA, we had a further five minutes with English newspapers and a further five minutes with FIFA.com." In the five minutes access allowed to the wider world, journalists learnt that manager Fabio Capello knew his team -- which he did not reveal -- and that skipper Gerrard was confident of victory. Platitudes delivered, Bevington declared after five minutes and 12 seconds: "OK, everybody, thank you very much. I would like to invite the English Sunday newspapers to join us in a separate room." One reporter sarcastically clapped and with that the England delegation swept out of the room. Although German coach Joachim Loew failed to appear before the media on Saturday, he did speak to them for 45 minutes on Friday and the German FA, at least, gave reporters the chance to quiz goalkeeping coach Andreas Koepke for 30 minutes on their preparations for the game.